S30 caps fit most homebrew kegs such as the Rotokeg, King Keg etc. 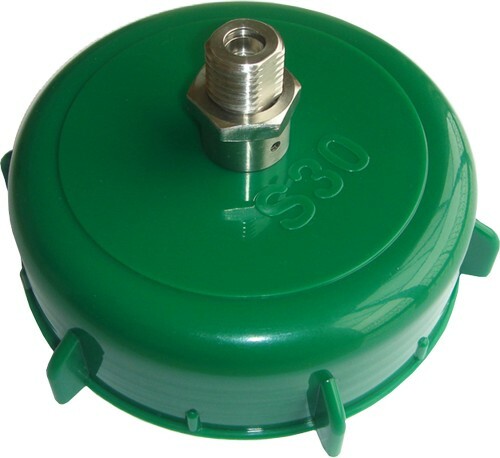 The S30 cap fits most pressure barrels for homebrew use, such as the Rotokeg, King Keg etc. It is equipped with a high grade Stainless Steel S30 valve and it comes in either the pure S30 version (for large S30 cylinders) or the 8g version intended for small 8g bulbs (to be combined with the S30 8g bulb holder). If you change your mind after purchasing one of the S30 Cap versions, it is simple to convert it into the other. Simply remove the pin from a pin version cap and you have the pure S30 version, or buy a conversion pack (pin + o-ring) and insert in the S30 version and you can use it with 8g bulbs. S30 products from Hambleton Bard work perfectly with other components of the S30 system. Avoid any "compatible" brand as use of these will void the function guarantee of the whole system. For a genuine S30 valve + S30 cylinder, Hambleton Bard will guarantee the function and refill cylinders free of charge if there ever is a problem such as an uncontrolled leak. This guarantee does not apply to any valve or other product compatible with the S30 system but not manufactured by Hambleton Bard.